De la Motte Fouqé. 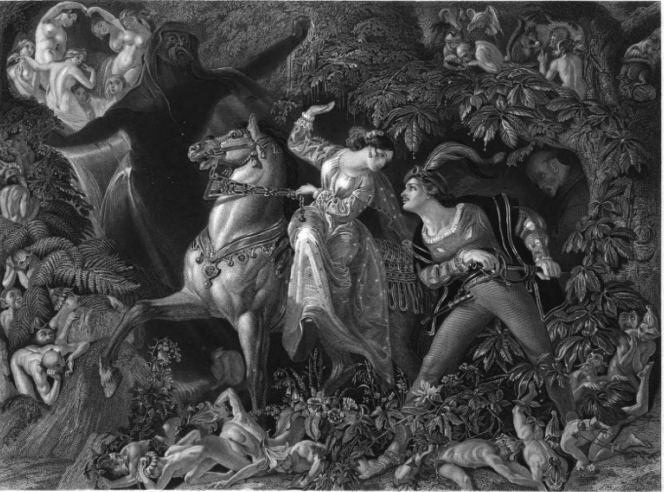 in his exquisite romance of "Undine" has furnished Maclise with the theme of this picture. The passage illustrated is that in which the young knight Huldbrand of Kingstetten conducts his beautiful bride, mounted on a richly caparisoned steed, through the forest, followed by the dreamy monk, Father Heilmann. The spirit of the waters, Kühleborn, the uncle and guardian of Undine, having assumed the human form, watches their progress to protect them from "the madcap mimes of earth, and gnomes that haunt the woods." But the soul which by marriage was accorded to Undine, had separated her from the beings with whom she had been associated by birth; she repels the advances and declines the further guardianship of her uncle. In expressing his wrath, he terrifies the young bride, who shrieks and calls her husband to her aid. The knight springs to her side, draws his sword, and strikes at the head of KUhleborn. The sword flashes merely through a torrent, which, foaming from the hill-side, splashes among the group, while a voice is heard to exclaim, "Brave knight, continue always with the same courage to defend your lovely little wife!" The incident is happily illustrated by the painter: in treating this theme he has found matter for that play of fancy and that inventive power which mark bo many of his works. The picture is richly coloured and elaborately painted. The artist, Daniel Maclise, is a nativo of the city of Cork; he is, as the name indicates, of Scottish descent While yet "under age," he entered London, became a student of the Royal Academy, and obtained all the medals, including the gold medal which that body awards. In 1833 he exhibited his first picture — "Mokanna Unveiling his Features to Zelica"— at the British Institution. In 1835 he was elected an Associate; and in 1841 he was promoted to full academic honours. From the commencement of his career to the present time, he has laboured worthily and successfully to sustain the reputation he obtained at his outset in life. His pictures are numerous, and generally of large size. As an historic painter, he is justly regarded as one of the leading "glories" of the British school, and his claim to a distinguished position is acknowledged in every country of Europe. He is still in the prime of life, and in the vigour of intellect; his mind has been highly cultivated, and his professional knowledge carefully matured. “The Royal Pictures.” Art Journal (1855): 114. Hathi Trust Digital Library version of a copy in the University of Michigan Library. Web. 31 July 2013.